The reason Bengalis are hooked to Monsoon, as this is the only time when they get to see plenty of their favourite shiny silvery fish in the market. Yes am talking about Ilish or Hilsa, Benagal’s most favourite fish, which has a unique place in its culinary history and almost enjoys an iconic status. 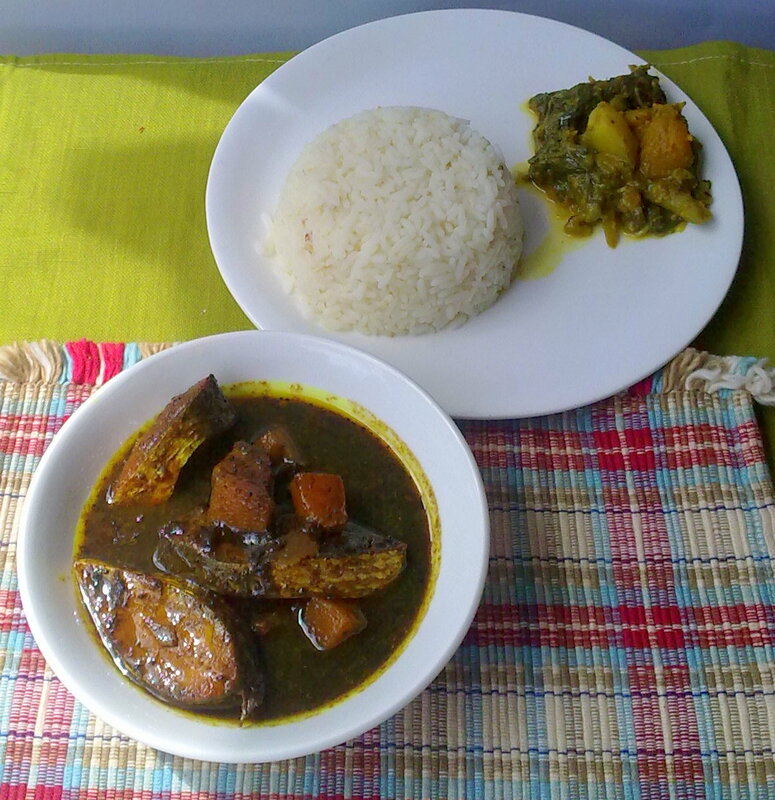 We Bengalis are famous for our love for fish and the various ways in which we cook them. But no fish is prepared in more ways than ilish…it is said that there are 50 ways of cooking Hilsa. It could be fried in the most easiest manner in mustard oil to whip up a quick meal to have with steamed rice drizzled with the Ilish scented oil, or a little time taking preparation of Ilish Paturi where Hilsa is cooked with spices and coconut, wrapped in plantain leaf. Then there is this ubiquitous Sorshe Ilish (Ilish cooked in green chili scented mustard gravy) to a little time taking preparation of Ilish Paturi (Hilsa cooked with various spices and coconut wrapped in Plantain leaf) or a very light aromatic Hilsa dish with eggplant and potatoes. This could be cooked in so many ways by frying, steaming, charring in banana leaves or by boiling in sweet and sour tamarind gravy. If that is not enough then the macher muro or the fish head is fried and cooked with Malabar spinach to get a finger licking good Pui shaker ghanto or Charchari and the delicate hilsa roes are either fried to relish with hot rice or cooked with amchur or raw mangoes to make a lip smacking chutney. Apart from its prominence in the Bengali culinary world it also holds a very esteemed position in Bengali culture. It’s the National fish of Bangladesh, a jamai sashti meal is never complete without atleast one dish of Ilish and a jora Ilish or Ilish pair is considered very auspicious on certain occasions. Even Bangals (the Bengalis from Eastern part of Bengal, now Bangladesh) celebrate win of their favourite football team with this fish. When it comes to Ilish I am pretty conservative not only because I don’t want to experiment with its taste but mainly because this fish is seasonal and in season they are quite heavy on the pocket. This year even after a good availability, a kg of medium sized Hilsa will lighten your pocket by Rs. 500-700. So when its hilsa I prefer to stick to old home style cooking. Those roasted Ilish in white sauce recipes shared on the cookery shows never enter my kitchen I love my share of Ilish cooked with the recipes shared by Maa and Dida. There are certain rules that are followed while cooking this fish. First, it should always be cooked in mustard oil; this said to bring out the best flavour and taste of the fresh catch. Trust me on this guys. Even we don’t eat mustard oil on regular basis. So tried cooking it with saffola and ended up having been subject to several scolding from elders. It gave it a very different smell, which in no way was appetizing. Also this fish itself is very oily so if you are concerned about the amount of oil issue then be assured that it needs very less oil for cooking. Secondly, Hilsa is mostly cooked in a simple manner with only few spices and the most popular spice combination is nigella seeds, green chilli and mustard paste. I never came across any dish of Ilish with onion and garlic. Thirdly, Hilsa pieces are never washed; it is said that way the very Ilishy smell of the fish is sacrificed. So the whole fish is washed several times along with the knives before cleaning and cutting the fish. In our house Baba buys a lot of Hilsa during season, as everyone in the house loves hilsa. Mostly it is cooked on holidays when time could be devoted to pick the bones and to relish it course by course without any hurry. Apart from her special Ilish Macher Matha die pui shaker ghanto (Malabar Spincah with Hilsa head), Maa would always make two main dishes one with mustard sauce and another… Baba’s most favourite Ilish Macher tak (Pronounced as TALK) or hilsa cooked in sweet and sour tamarind gravy, which a dear friend of mine fondly calls Khattiwali Machhli or sour tasting fish. 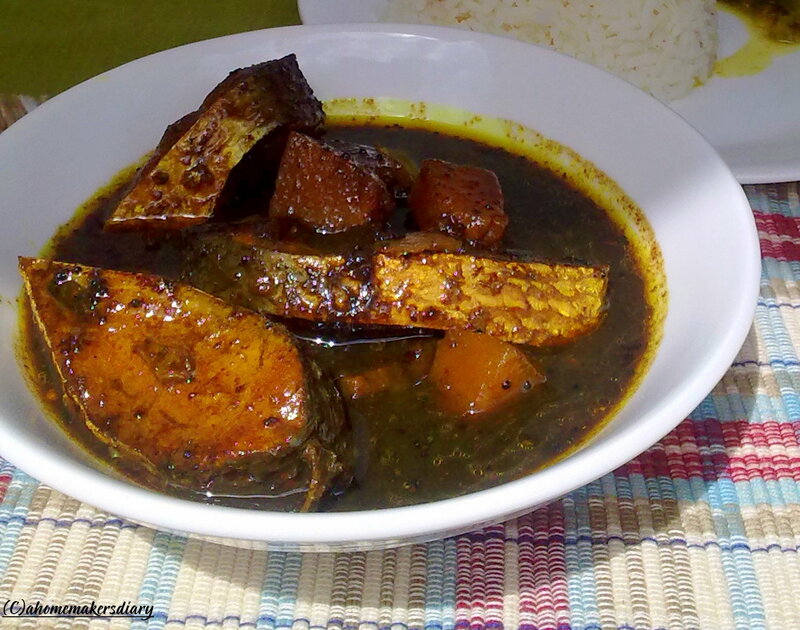 When cooked with old stored tamarind this dish is said to cure a certain type of Diarrhea. Hubby also loves this dish so after cooking the khichuri and machh bhaja the next day I made this with our first Hilsa of this season. Tamarind: this totally depends on the quality and tartness of the tamarinds and also on how much sour taste you like. Generally this dish has a balanced taste of sweet and sour so please adjust the quantity as per your taste. Always start with lesser amount, say 1-cup light tamarind extract, later if needed add on thick juice spoon by spoon. I used an year old stored tamarind. Soaked a ping-pong ball sized tamarind, which yield 1/3 cup of thick tamarind juice. Smear the hilsa pieces with salt and turmeric and keep aside for 5 minutes. Heat the oil to smoking point in a heavy bottom pan. Lower the heat and carefully fry the fish pieces for a minute or so on both sides. Take out and keep aside. In the same pan add the mustard seeds and red chillies. Once they sizzle add the pumpkin pieces and fry with salt and turmeric on medium heat. Once they are soft add the tamarind juice mixed in a cup of water. Cook on medium and bring it to boil. Add in the fish pieces. Add sugar and salt to balance the sourness of the tamarind. Add sugar little by little to achieve the taste you like most. Cook till the gravy thickens and you get the taste you like. Serve hot or at room temperature with steamed white rice. Note: this dish could also be cooked with small sized prawns, but in that case use more tamarind extract as prawns will soak most of the sourness. 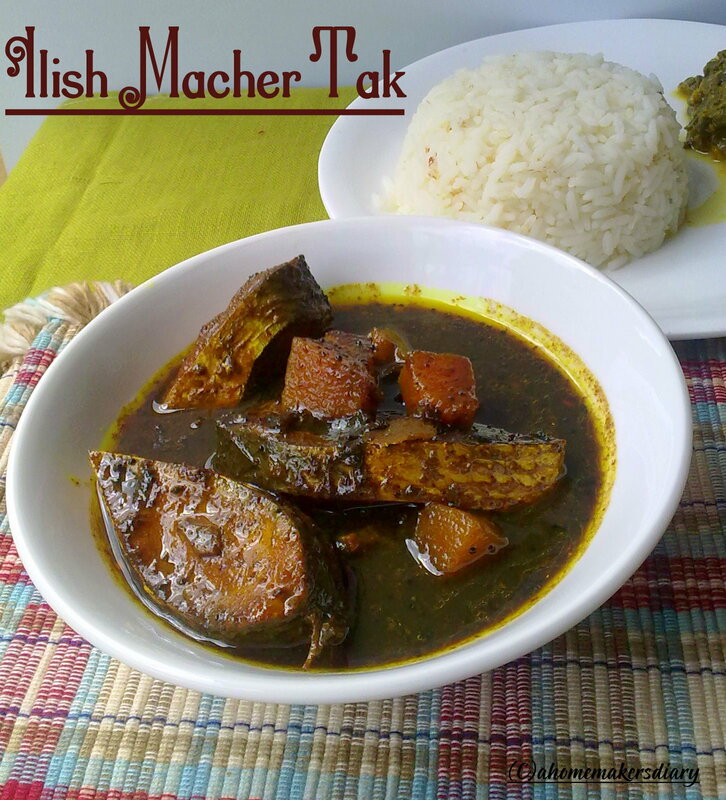 We also make another Macher Tak with Rohu or any big fish with dried mangoes(amchur) and mustard paste. will try to post that soon. Was just searching Wikipedia and it says that Shad and Herring are popularly used in place of Hilsa. The taste and flavour is quite close. This bowl of sweet and sour Ilish macher tak is off to Jay’s I love my Dad event. Ilish, Hilsa, Macher Tak, Ilish tok, Ilish Ambol, kumro Ilish, Hilsa Bengali, Bengali food, Bengali fish, Bengali Cuisine, Bengali Hilsa, sour Hilsa, Tamarind Ilish, Mustard seeds, Bangal Tak, Dry chillies, red chilies, sweet n sour fish, tak mishti mach. Ilish Machh, Padma Ilish.Fish curry.shad in gravy, Herring in sour gravy, Bengali fish curry, Bengali side Dish, Indian Fish in gravy. This is just great and a wonderful entry for the event...! Khoob shundor...eta aamaar Mum'er fav. My mouth is actually watering and you know why! Lipsmacking and mouthwatering gravy, pass me that bowl, am ready to finish rite now.. This looks a traditional bengal recipe.. It looks so inviting. Wish I could have it right away. bhishon khete ichey korchey. when i was little i never used to like the tak with fishes, kintu as i grew i started loving and craving now that i get none of it. This is the first time I have seen tamarind in a Bengali dish - this is very similar to the Kozhambu we make - though it will be much spicier and not sweet. Any other fish I could use instead of hilsa? @Sanyukta, Jay...Would have loved to pass on the platter dear. come home anytime. Love you all. @Pree, buhhechi. kache thakle roj banie khaotam. tumi ei samay tentul er achar kheo hemoglobin baray and tasty too. @Deepa, ami paturi konodin banaini. ebare bhalo Ilish pele bananor iche ache. Baba asbe kadin pare Ilish ante bolechi. bhalo hole tomakeo dakbo. @Miri, have updated the post with other fishes too. prawns work best in the dish. Thanks for visiting my site and leaving those sweet words. Love to be here. Am following you to keep in touch. Thanks sayantani, I didn't notice you already had this recipe posted. Sounds great. Will try this out. Can I use any fish for this or only the one you emntioned? Mouth-watering fish curry..Love to have it with rice right now..
@ Sayantani, regarding the spinach color, the trick is not to add water at all while its on flame. What I do is add about 1/2 cup while grinding the spinach with green Chili. After you grind it, don't add any more water. After the puree thickens a bit, switch off the stove and add cream. That will give you the real green color. WOW..that platter made me hungry Sayantani..feel like grabbing that from the screen and have it for the lunch...looks de-lish! Hey i have had many Bengali friends and I know their love and admiration for Hilsa. It's a catch that's craved for! Bari giyechilaam..ilish khelaam bhalo laglo onek din por...tumaar eyi ranna dekhe amaar jhibe jol eshe jache Sayantani,iche korche ekhono khete partaam to koto bhalo hoto.Mouth-watering stuff :-).. I have never read such a great article on dear Ilish. Thank you so much. 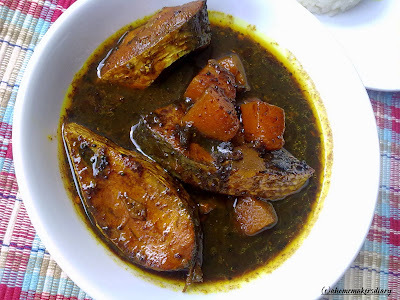 also very popular among some bong families in Cal, addition of a dash of ginger with traditional mustard recipe..
Ilish is available through out the world including USA.Potomak river Ilish khub tasty sunechhi.. I have never tried Ilish machher tak , will make soon...I like it but haven't eaten recently.